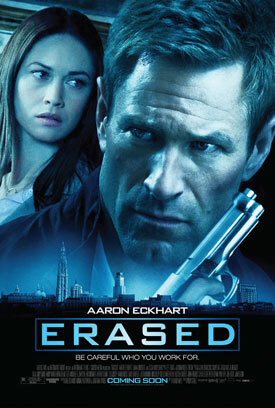 Watch the Movie Trailer for Erased. Aaron Eckhart, Olga Kurylenko and Liana Liberato star in the espionage thriller. When ex-CIA agent Ben Logan (Eckhart) discovers that he and his daughter have been marked for termination as part of a wide-reaching international conspiracy, a dangerous game of cat-and-mouse ensues as Logan tries to outsmart his hunters and uncover the truth. Ex-CIA agent-turned-high tech security expert Ben Logan (Aaron Eckhart) and his estranged teenage daughter Amy (Liana Liberato) are forced to flee for their lives in Belgium after the division of the multinational corporation where Ben works is mysteriously shut down, and his former assistant targets them both for death. Now, every move that Ben and Amy make could be their last, and in order to survive they must put their trust in one another while attempting to find the source of the deadly conspiracy. But when Amy learns the truth about her father’s clandestine past, trusting him won’t come easy.